Mumbai, 31 March 2015: The flagship brand of Parle Agro- Frooti has undergone a brand revamp and has launched a completely new identity and visual language. The rejuvenated visual identity, including logo design and packaging aims to demonstrate Frooti as bold, fearless and iconic alongwith establishing its equity amongst a much larger audience to help it acquire a wider consumer base. This summer, Parle Agro is completely set for a national launch of the new Frooti packaging designs accompanied with pan-India marketing campaign introducing ‘The Frooti Life’ to all its consumers. Frooti has always been way ahead of its time since its inception in 1985. Be it the launch of the first ever Tetra Pak, PET bottles, TCA triangular packs or Bottle Packs, it has always strived to remain relevant to the youth. However, considering the huge popularity of Frooti as a kids drink, the only way to break away from the past was to undertake a radical brand makeover. The move is in line with the brand’s vision to make in-roads into new consumer groups especially amongst the 15-30 year old young adults. While Frooti has always held a dominant market share in the TetraPak category particularly amongst kids, the launch of fruit drinks in PET bottles in India expanded the target consumer base to teenagers and young adults. Today, the acceptance of PET and its growth is one of the fastest in beverage industry and contributes to 50% of the overall 6000Crore Mango Drink market. Keeping this at the core, the time was right to relaunch Frooti in a bold new look to be able to establish a strong foothold in the PET segment. With this, a new structural design for Frooti PET has been developed to provide better strength, superior grip and a larger label area for branding. Even the formulation has been enhanced by increasing the food pulp so as to provide a more mouthful experience to the consumers. The new Packaging Design which was rolled-out in mid-January for select SKUs alone has shown agrowth of 60% and seen a 80% boost in visibility as of today. 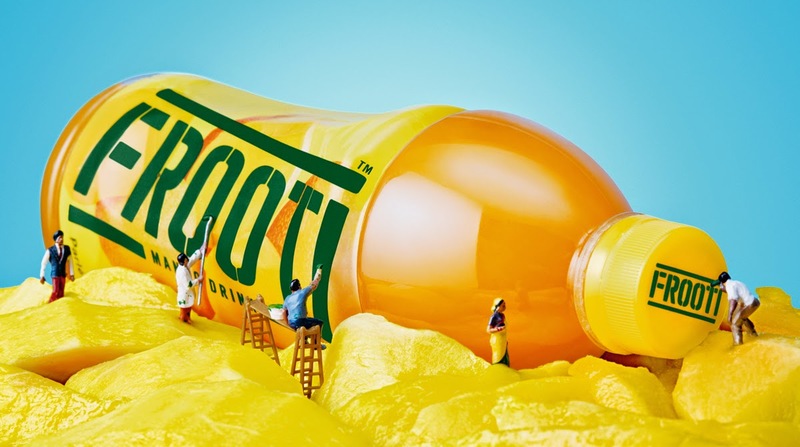 Parle Agro collaborated with the world’s leading design and creative consultancies, Pentagram for Frooti’s packaging makeover and Sagmeister & Walsh for Frooti’s summer campaign. The decision to engage with international firms was strategically planned to ensure that the makeover was advanced with a fresh perspective. A new approach towards the brand was crucial to be able to break away from its traditional personality. Spends to the tune of INR 70 crore have been invested across a strategic mix of media vehicles that appeal to teenagers and young adults. Television will play the role of the lead medium for the campaign, where the TVC featuring Shah Rukh Khan, shot in stop motion style animation will offer a delightful visual experience. Amit Trivedi and Amitabh Bhattacharya have added a strong musical element to the TVC. Being the market leader in mango drinks category, it was important that Frooti breaks through the clutter and conventional category codes with a packaging redesign and a 360 degree marketing approach to ensure maximum brand visibility and reach in newer markets and consumer segments.With this move, Frooti is determined to get a 50% growth in sales and reinforce its leadership position in the market. Parle Agro is optimistically working to build on a deeper and stronger emotional connect with the consumers with new Frooti.